There's no way to use your feet to activate the "Sostenuto-S" function. You can only activate it with the S1 and S2 switches on the synth pickup, which is somewhat inconvenient to do while playing. When using "Sostenuto-S" there is no way to get the synth to not play new notes when you play over a sustained chord. In other words, you can't sustain a synth chord, then play over the top of it with just plain guitar sounds. I decided to cut the 13-pin Roland cable (as shown on the cable cut page), and put a box in between with a circuit to solve both problems. The box has 2 1/4" jacks into which you can plug two footswitches, one to replace the GK-2(a)'s "S1" switch, and another for "S2". For this to work, you must go into the GR-50's "System" menu and set S1 for "Sostenuto-S", "Unlatch". You can set "S2" for whatever you like. I usually set it for "Modulation", "Latch", so I can use it to control the Leslie speed on Hammond organ sounds. Opposite-gender DB25 connectors are used so that they can be plugged together and the cable used normally if desired. The box has DB25 connectors to which you connect the DB-25's on the cables. There is a switch on the box that controls whether or not you will get more synth notes while playing over a sustained chord. The operation is very simple. When you are in the no-new-synth-notes mode (Mode 2), three DPST DIP relays disconnect the hex pickup signals from the GR-50 when you push the sustain pedal down...crude but effective. The diodes on the coils of the relays are very important because they prevent popping in the regular guitar audio caused by the inductance of the coils when the relays open. 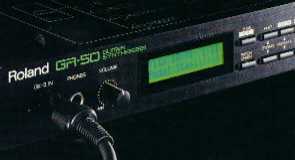 In these mp3s the GR-50 is driving the Native Instruments B4 Hammond organ simulator. The straight guitar signal is going through my Roland GP-16 and a couple of Hughes & Kettner Red Box Pro's. In "Mode 1" (toggle switch up), the Sostenuto-S function behaves as normal. When you are driving an external synth via MIDI, this means that any notes sounding when you hit the pedal will sustain till the pedal is released. When you play new notes with the pedal down, notes on strings that are not sustaining will be played by the synth. In "Mode 2" (toggle switch down), notes you are playing when the Sostenuto-S pedal is down sustain as before. But if you play any new notes while the pedal is down, the synth does NOT respond to them. This allows you to solo over the synth chord with straight guitar sound.